Welcome back to part two of this short blog series! 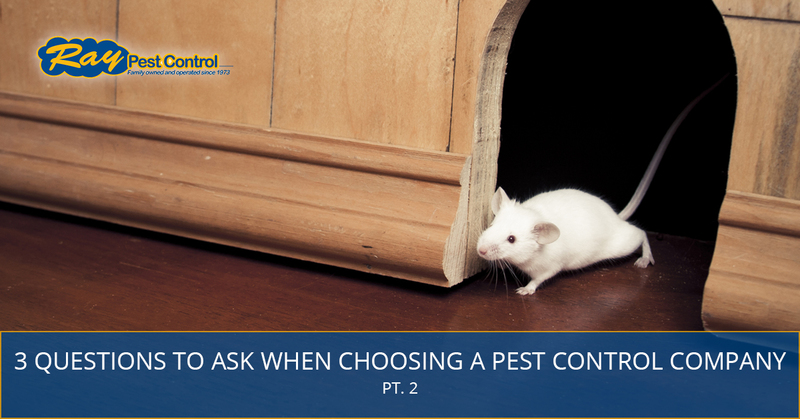 In our recent post, we began looking at some important questions to ask as you research pest control companies here in Piedmont. Now that summer is upon us, you will likely be combatting the common summertime pests that can make spending time outdoors a real nightmare. While there are DIY pest control treatments you can experiment with, you might prefer to turn to the professionals for expert help in getting rid of those pesky creepy crawlies and furry invaders. As you search for a pest control company, below are some questions you will want to consider. To learn more about our experienced and friendly pest control team at Ray Pest Control, and how we can eliminate your pest problem, follow these links to access our About Us page and pest removal services. What Kind of Treatments Do They Offer? If you are reaching out to a pest control company, you probably have a specific pest or rodent problem that needs to be addressed. While this will certainly determine the pest removal services you require, you will want to learn more about the company’s methods and treatments for removing pests. For instance, if you have a bed bug infestation, you will want to find out if the company offers chemical treatments or bed bug heat treatments. Or if you have snakes, moles, groundhogs, and other rodents, you will want to learn about the company’s removal and preventative methods. You can visit the Ray Pest Control site to access the pest control treatments and methods we offer, which can help you determine if our pest and rodent control services are right for your specific needs. Are There Company Reviews I Can Access? Reviews can be incredibly important when choosing a pest control company to work with. Customer reviews give you a basic understanding of a company from the customer’s perspective. While you can access reviews on a business’s site, it is also a good idea to check the Better Business Bureau (BBB) and sites like Angie’s Lists to access company reviews. For instance, our termite and pest control company has received an A+ rating from the BBB since 2015. While we have this listed on our site, you can access the BBB to read specific reviews about our customer service and our pest removal services. Is The Company Professional and Knowledgeable? Professionalism goes a long way in the pest control industry. Because you will be letting a stranger onto your property and into your home to complete a service, it is important that they appear and act in a professional manner. This can provide peace of mind for you. You will also want to work with a company that is competent and able to complete the pest control services you require. The technician should be able to answer your pest control questions, and is he or she doesn’t have the answer off-hand, they should be willing to do further research and get back to you. Every small business has to start out somewhere, but working with a reputable, experienced, and knowledgeable pest control company is crucial. If you are ready to work with a pest control company in Piedmont that encompasses all of the excellent characteristics that a Top Rated Local® business should have, call Ray Pest Control. Whether you need to get rid of annoying insects or protect your home and property from intrusive rodents, our friendly and knowledgeable pest control technicians are ready to help! Give us a call today or reach out to us online to get a free estimate for pest removal and rodent control.